Remember PE Kit. Cancel free trial. Call mum... everyone writes instructions to their future selves - but what if the future starts writing back? Rosy Carrick has to build a time machine - because her future self has already done so and is now stuck 100 years in the past. Given that her knowledge of quantum physics is limited to the works of Arnold Schwarzenegger, Rosy must summon the help of science's greatest minds if she is to rewrite history and save herself... Darting playfully between multiple narratives, this complex and emotional performance explores the realities of time travel and self-determination - taking in Bowie, motherhood and some most heinous hangovers along the way. 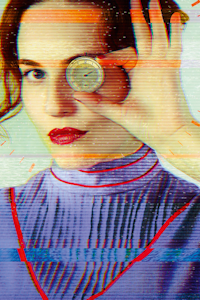 Winner of Brighton Fringe's Best New Play Award 2018 and The Infallibles Award for Theatrical Excellence, Passionate Machine is a hilarious and searingly honest story about obsession, salvation and finding yourself - literally. Performers Rosy Carrick, Rosy Carrick. Between 23rd May 2019 and 7th June 2019 this tour will visit 3 venues in Newport, Clevedon and Exeter. Current and future dates only. This production has already been seen in 3 venues since 17th March 2019. You can embed this tour information on your own website by adding a single line of code to a page and using the Qtix code T01434880281 - for details see our Embed Information page. Receive email notifications of changes to Passionate Machine.